Does your resume need a thorough checkup before you apply for your next dental assistant job? Examine our sample resume for a dental assistant here. To be a successful candidate for dental assistant jobs, resume expert Kim Isaacs says it helps to have a comprehensive resume. Is updating your resume like getting a root canal? For ideas on how you can give your resume a routine cleaning, check out our dental assistant resume sample that Isaacs created below. 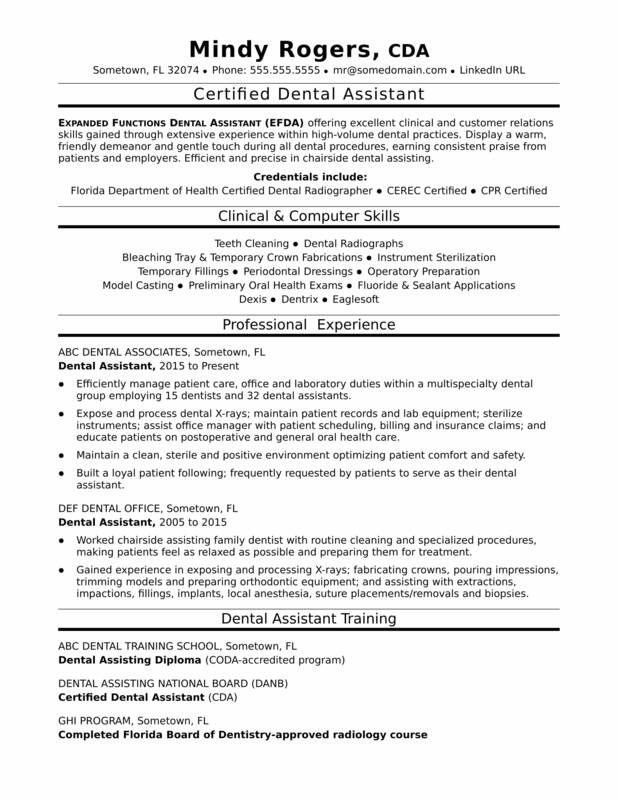 You can also download the dental assistant resume template in Word. Jobs for dental assistants are projected to grow by 19% (or 64,600 jobs) from 2016 through 2026, which is much faster than average, according to the Bureau of Labor Statistics (BLS). You'll find the highest level of employment for this job in the following states: California, Texas, New York, Florida, and Illinois; and in the following metropolitan areas: New York City, Los Angeles, Chicago, Houston, and Dallas. As a dental assistant, you can expect to earn a median wage of $37,630 per year, or $18.09 per hour, according to the BLS. Additionally, you can learn more about healthcare careers on Monster. Expanded Functions Dental Assistant (EFDA) offering excellent clinical and customer relations skills gained through seven years of experience within high-volume dental practices. Display a warm, friendly demeanor and gentle touch during all dental procedures, earning consistent praise from patients and employers. Efficient and precise in chairside dental assisting. Much like teeth, your resume needs to sparkle in order to convince hiring managers that you're the one they should hire. Could your resume use a little extra polish? Get a free resume evaluation today from the experts at Monster's Resume Writing Service. You'll get detailed feedback in two business days, including a review of your resume's appearance and content, and a prediction of a recruiter's first impression. It's a quick and easy way you can give your job search a boost.